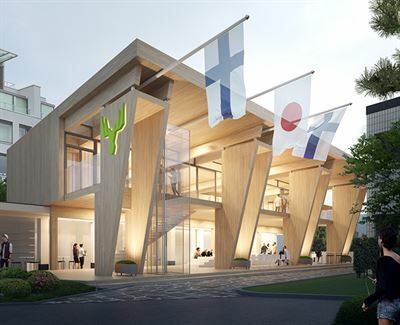 Metsä Group and Business Finland are joining forces in building a wooden Metsä pavilion to be used in Tokio during the Olympic games. The pavilion will be built on the grounds of the Finnish Embassy in the centre of Tokyo. The Metsä pavilion offers multifunctional facilities which lend themselves to many kinds of events: exhibitions, seminars, celebrations and relaxation. It will serve as a meeting place for Finland’s Olympic team during the Summer Olympic Games and the Paralympic Games. The Metsä pavilion is an excellent example of the advantages offered by industrially manufactured wood elements. Building with Kerto® LVL elements is fast and the lightness of the material enables construction on top of existing buildings, as is the case in Tokyo. Similar elements can be used also in buildings of larger scale. “The pavilion takes advantage of high-quality wood products – which function as a long-term carbon stock – in a variety of ways. The pavilion can be transported to the site as ready elements, unloaded, moved again, and re-assembled. This is in line with Metsä Group’s goal to replace fossil-based products with renewable and recyclable materials,” says Mikko Saavalainen, SVP, Business Development, at Metsä Group's wood products industry Metsä Wood. The Kerto LVL products to be used in the pavilion’s construction are ecologically sustainable and efficient in terms of their material. The production process of the materials and elements generates very little waste. The elements will be pre-assembled at the plant of Metsä Wood’s partner company and, thanks to this, assembly on site will be rapid. The architectural design of the Metsä pavilion will be carried out by Helin & Co Architects. The design is based on the Kerto® LVL-based elements published in Metsä Wood’s Open Source Wood service. Metsä Groupwww.metsagroup.com Metsä Group is a forerunner in sustainable bioeconomy utilising renewable wood from sustainably managed northern forests. Metsä Group focuses on wood supply and forest services, wood products, pulp, fresh fibre paperboards and tissue and cooking papers. In 2018, Metsä Group’s sales totalled EUR 5.7 billion, and it employs approximately 9,300 people. Metsäliitto Cooperative is the parent company of Metsä Group and is owned by approximately 103,000 Finnish forest owners.